After the cruise we walked along the river to the Royal Botanic Gardens. I am a crazy plant lady. Or am I normal? At this time of year I make several runs to my local garden shop and spend loads of money to surround myself with doomed house plants. Is there something in the human spirit, our circadian rhythms, or our sensory organs that craves green in the winter? I think this is one explanation for the origins of the Christmas tree. Anyway, I was in my glory in Melbourne as we boarded a trolley and listened to the silver-tongued commentary of our driver. She had one of those soft voices that lulls you into a trance. Once again, my photos were subject to that particular effect of the Australian sun that makes them look like my lens was smeared with Vaseline. I kind of like it. 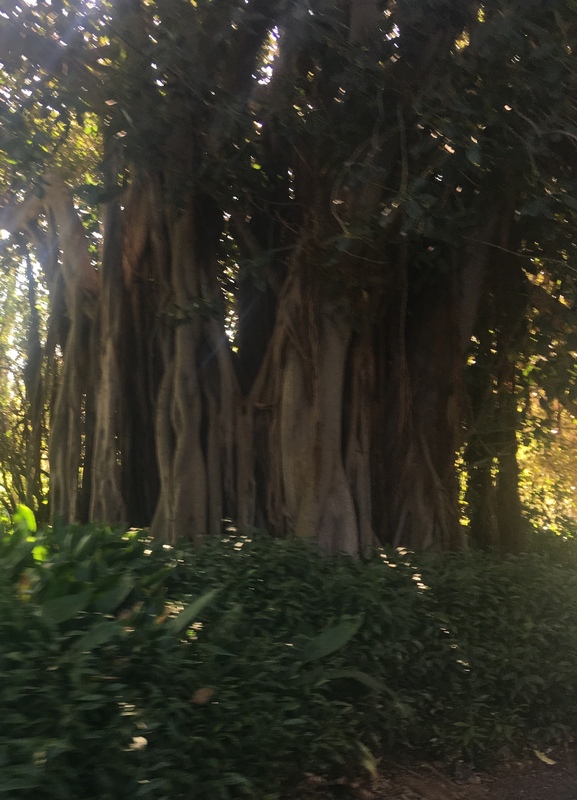 The guide said, waving toward a tree, “And here are some of our famous elms. We get lots of Americans coming here to see them,” she looked meaningfully at me. Hmm. We have elm trees in America. A lot of them were wiped out in the 70s by Dutch Elm Disease, but we still have plenty. 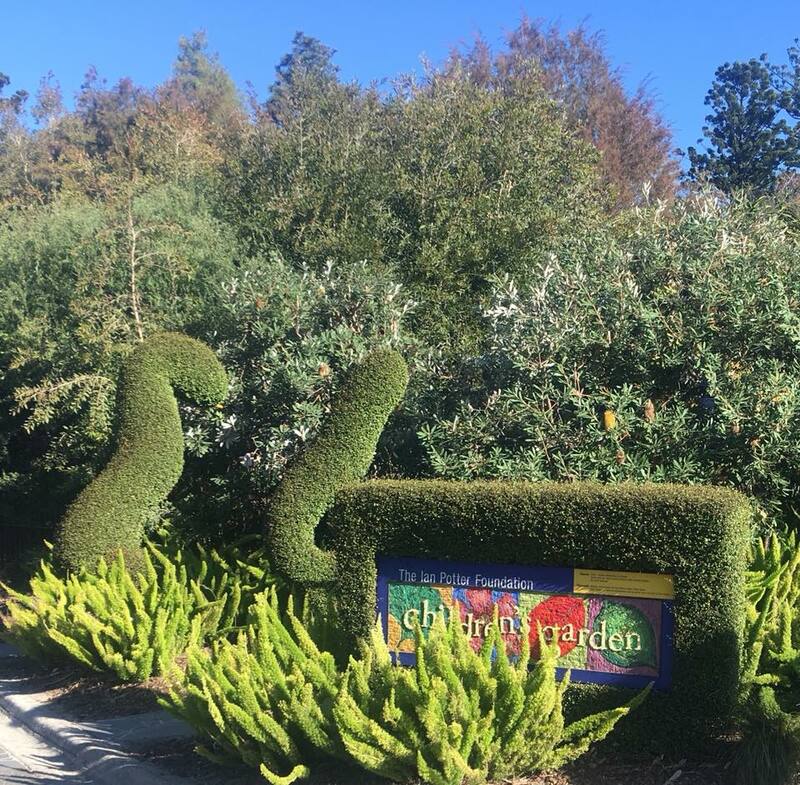 I wasn’t sure what she was talking about, but I kept my mouth shut because she was obviously proud of those trees. These are banksia nuts; what I would call cones. 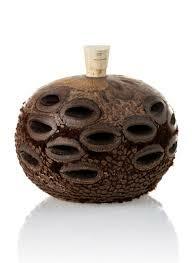 I bought some diffusers in the gift shop made out of polished banksia nuts. Normally I don’t like anything scented but I have one of these by my bedside filled with Eucalyptus oil. 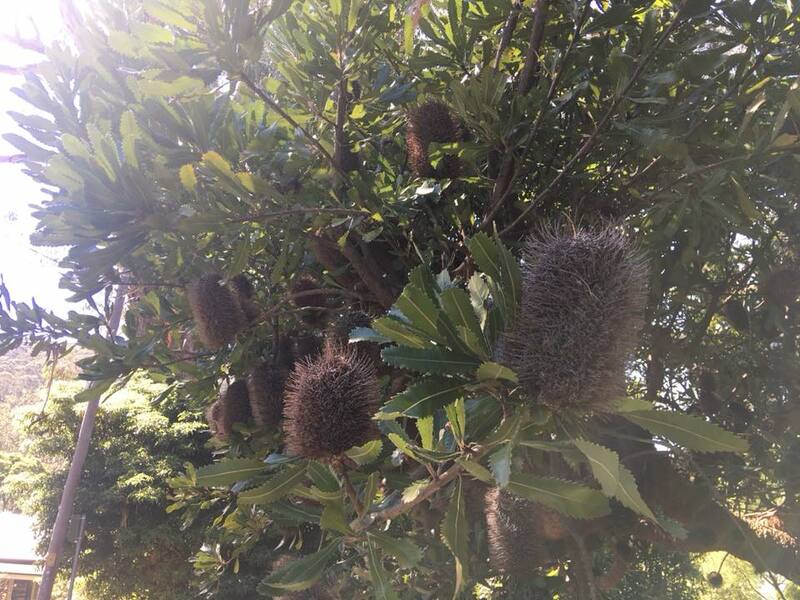 These are banksia flowers, one of 70 varieties. And gum nuts. 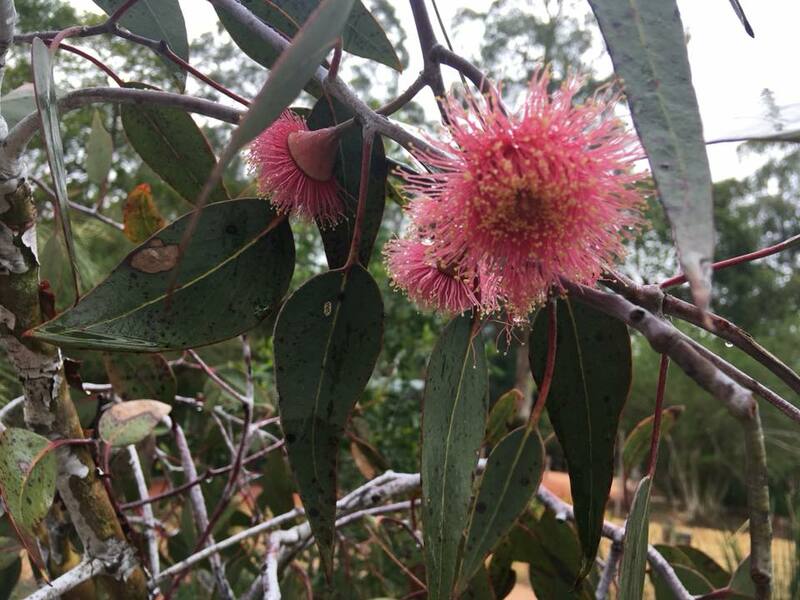 I don’t know why Eucalyptus trees are called gums, or why their flowers are called nuts. 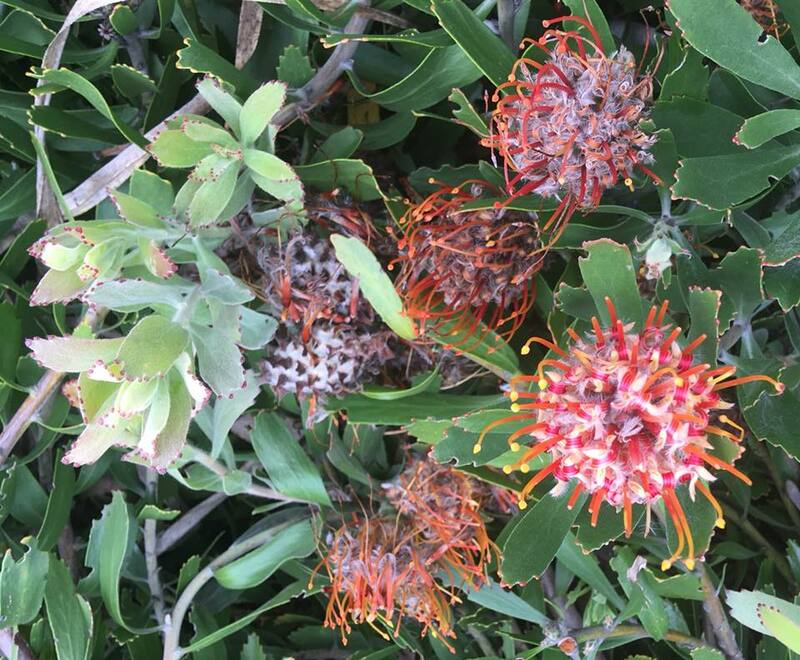 It kind of looks like the nuts burst open and flower. So are they really nuts? Who cares, they’re fantastic. 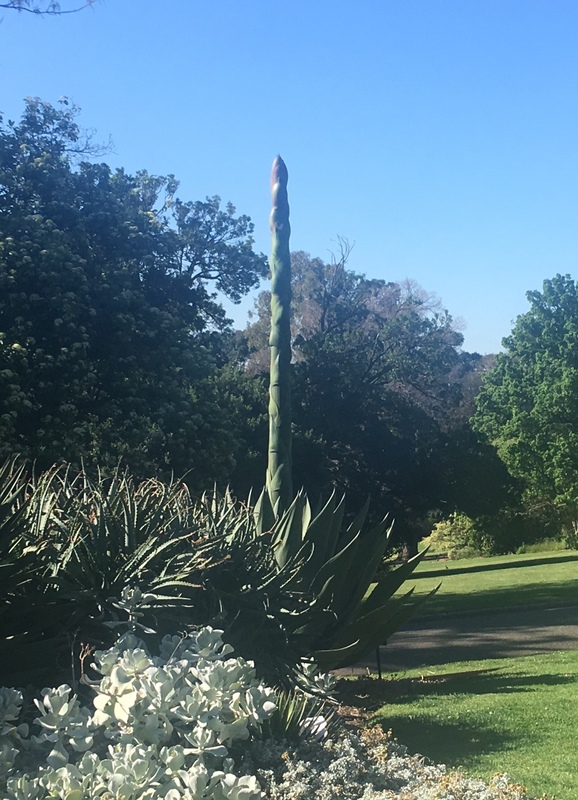 I don’t know what this was; all I knew was that anything that appears to be a 20-foot-tall asparagus spear must be photographed. “I could have stayed on that trolley all day,” I said to Heidi and Danielle after we reluctantly disembarked. The driver had politely but firmly said no when we suggested going around a second time. “Is that what it was?” I asked. “Like Crocodile Dundee,” said Danielle. She glanced at her watch. “Oh my gawd! We’ve got to meet Andrew!” Andrew, an old uni chum of Heidi’s. 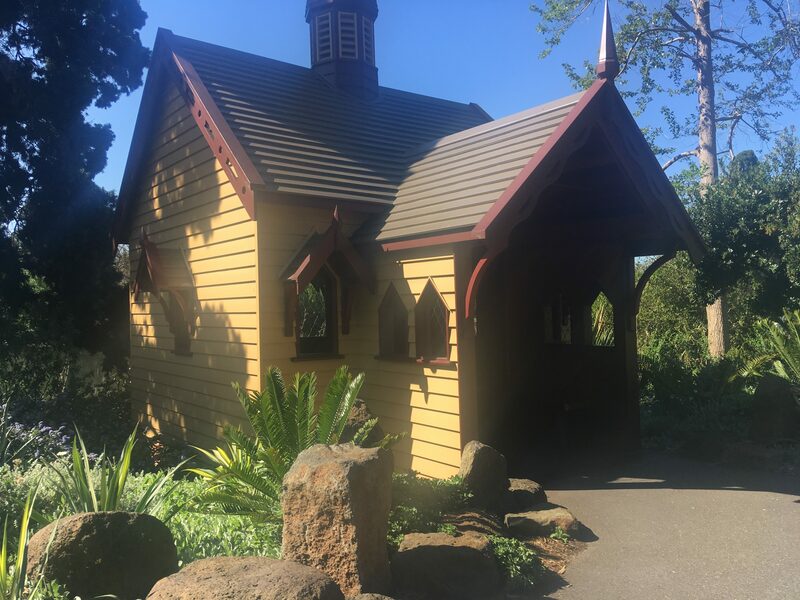 We raced past the Victorian keeper’s house and children’s garden. We got to Lygon Street in Little Italy where, once again, I had a moment of disorientation where wondered, “Where am I?” because all the restaurants were Italian and people were speaking Italian. We found Andrew and settled down at a sidewalk table with wine and pasta. Andrew works for a Member of Parliament and commutes to Canberra during the week—a seven- to eight-hour drive or one-hour flight. We talked more about language. “The state south of yours is the Mexicans,” Heidi said. “Fair dinkum means, ‘You’ve got a point’,” said Danielle. “What’s a slice?” I asked, and was informed it was another name for a bar-type dessert, like a brownie. “That’s just food,” Andrew explained, as he twirled his spag bol. 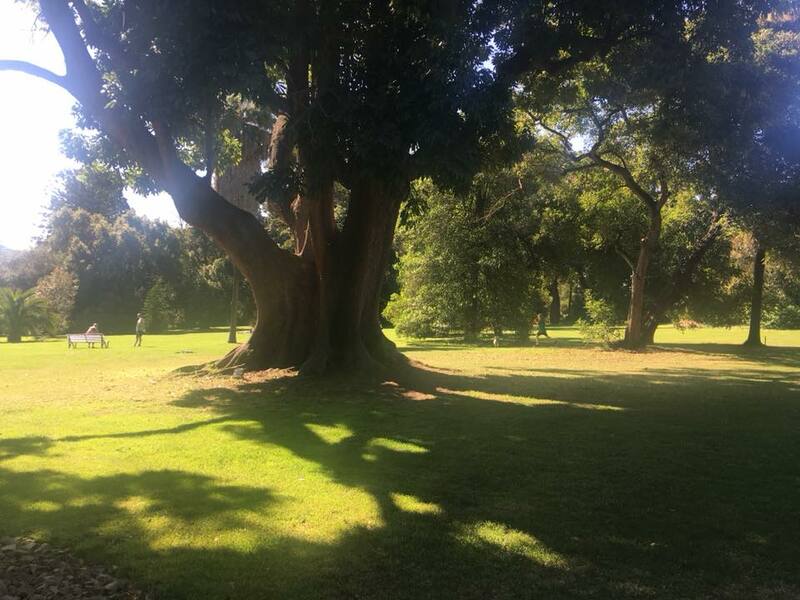 This entry was posted in Adventure, Budget travel, Culture shock, Joie de vivre, Living abroad, Travel and tagged Australia, Australian Accents, Australian Slang, Little Italy, Melbourne, Royal Botanic Gardens on January 17, 2019 by Breaking Free.